Discover Sycamore is proud to present the sixth annual Taste of Spring in downtown Sycamore on Wednesday, April 11th from 4-8 pm. Come experience an evening dedicated to the finer things in life. Sparkling white, rich red, and, oh yes, food and desserts! Each wine course will be professionally paired with a food tasting. The event begins at Blumen Gardens (403 Edward Street, Sycamore) at 4pm. 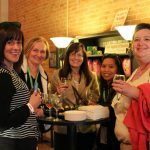 At Blumen, you will receive your custom wine glass, tasting lanyard and the list of downtown businesses participating. Guests must be 21 or over to participate.